I finally have the image complete for my Christmas cards and here it is! I considered many ideas....geese on a frozen pond, a wintry landscape, a pheasant strutting in the snow, but I kept coming back to this bright, red Northern Cardinal all puffed up to stay warm on a cold, gray winters day. I know that this is an often seen image on a holiday card, but I had lots of reasons for choosing it. The extremely cold weather in our valley, the gray skies and softly falling snow that followed it, the way the birds at my feeders all puffed themselves up to stay warm all contributed to this image. 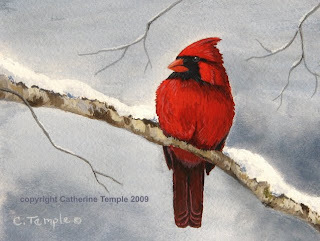 But I think mostly I chose it because we don't have cardinals here and I miss seeing their bold colors accenting the subtle shades of winter. I grew up seeing them in Illinois, loved to watch them at my feeders and listen to their beautiful calls. I guess I may have chosen him because he reminds me of my childhood home and lots of folks think about that this time of year. I hope this little bird brings as much cheer to you as he does to me! Christmas is just a short time away now. Hopefully, you all are getting your shopping done and starting to enjoy the holiday festivities. Don't forget to take time to remember why we have this season in the first place. It's not about Santa, reindeer and gifts. It 's about the birth of a Savior, the hope of nations, Jesus Christ. And considering the condition of our world these days we need this hope more than ever. Many, many blessings to everyone this Christmas season and prayers for a better New Year!